A would-be thief has been taught a valuable lesson after being caught by a man who found him attempting to break into cars. Jonie Marree Marty filmed the moment her partner Cameron confronted a young man after they noticed him acting suspiciously around their Aitkenvale street in North Queensland about midday on Monday, Townsville Bulletin reports. "We noticed him look into a car in our yard, then walk up to our 90-year-old neighbour's driveway peeking in the back of her yard, then straight to a car parked opposite and lift the handles," Ms Marty said. "That's when my partner Cameron got in the car and drove around the corner where he caught him trying to open another car door in someone's driveway." Cameron told the foiled thief to sit down on the side of the road, where he gave the man a very stern reprimand. Ms Marty said the young man, wearing a high-vis shirt and work boots, admitted to trying to break into cars for "extra tobacco or just what he could find". "He was not able to hide and admitted it was stupid," she said. Ms Marty described the man as "clearly upset and shaken, not to mention very apologetic" following the talking-to by her partner. "Cameron's a very quiet man in everyday life but with very old school morals," she said. "He's a husband, a father, a son and a brother and everyone's neighbour." Cameron has since been hailed a hero after videos of the stern talking-to were posted on social media. "It's fair to say he does not feel like a hero, he's just the kind of guy who's more worried about our neighbours feeling safe in their homes," Ms Marty said. "He's a good bloke with a big heart, it's always just about doing the right thing with him." The man was eventually arrested by police at the scene. 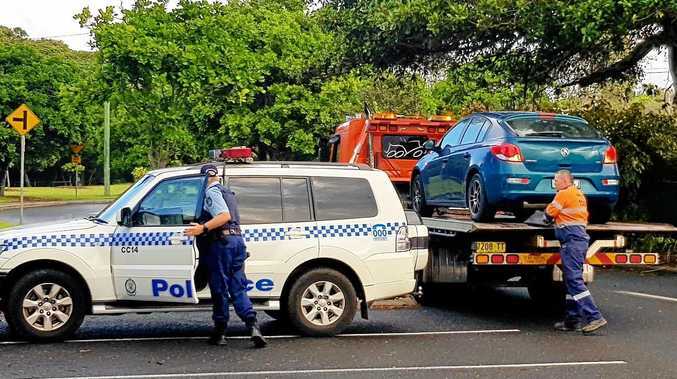 A Queensland Police spokesman said the man had not been charged, however the investigation is ongoing. An Aitkenvale man gave a would-be thief a stern talking to after finding him attempting to break into cars.